Riad Food Garden is a café and flower shop, open from breakfast (for sleepyheads only) till after dinner, with aperitivo being its top moment. Not only you can buy food and plants but also almost any item you find inside (the decoration, design pieces, lamps etc). When the weather is nice there are some tables outside and the French windows are completely open, so as to let the sun and air in. 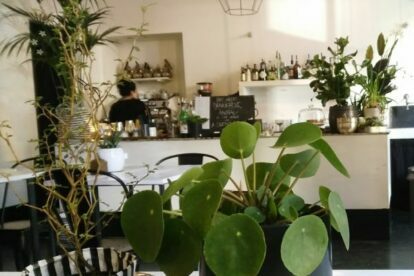 On Saturdays, Riad is closed (but can be booked for private parties) and on Sundays it has a nice brunch (25 euros), with a small buffet and a hot dish to choose between 2 options. During the week I sometimes go for lunch there (main dishes are approximately 10-14 Euros, with the menu changing daily, but always having a vegetarian and a vegan option beside the “omnivorous” one) although their aperitivo is my favourite: their drinks are really good, especially those made with fruit (they always use fresh fruit). It is a good alternative to a light dinner: with the drink you get a silver plate with some Moroccan dishes (hummus, couscous etc. ), vegetables and potpies.